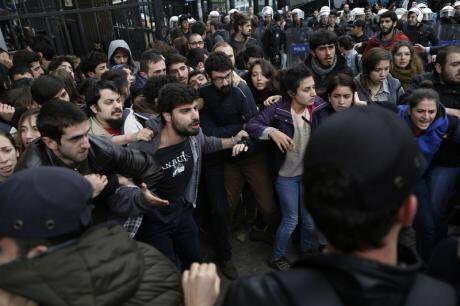 Student protest against YOK dispersed by Istanbul riot police outside University of Istanbul using teargas and rubber bullets, 2015. Demotix/ Sahan Nuhoglu. All rights reserved.Since the collapse of the peace process, the government of Turkey in order to fight the YDG-H has declared 58 open-ended curfews in Turkey’s South East. But the failure to take measures to ensure civilian life and some Government forces’ misconduct has been harming the civilians’ right to life, liberty, and security. These human rights abuses are documented by Human Rights Watch, Amnesty International and Human Rights Foundation of Turkey. On January 11, 1128 academics from Turkey issued a declaration called, “ we will not be a party to this crime”, with the support of 356 international colleagues including Noam Chomsky, Judith Butler, Immanuel Wallerstein and Slavoj Zizek. The non-partisan declaration was asking the government to end these human rights abuses, prosecute those responsible and resume the peace process. However, on January 12, right after the ISIS bombing in Sultanahmet, President Erdogan, in an attempt to divert public opinion, targeted our declaration. He denied the human rights abuses, framed our declaration as “terrorist propaganda”, labelled us “ignorant, pseudo-intellectual, and colonialist” and called on educational and legal institutions to take action. Subsequently, the mafia leader Sedat Peker, known for his organized crime but also his friendship with the President, issued a statement promising that he would spill our blood in return for this terrorist propaganda. The alignment of our declaration with terror was also evident in the speeches of PM Davutoglu who argued that the “declaration represents a PKK mentality” and of Bekir Bozdag, who surmounted him by saying that “the declaration is drafted by PKK itself”, a statement that is also aimed at degrading our intellectual capability. While these statements have been met with strong international criticism from Noam Chomsky, Judith Butler, the Middle East Studies Association, PEN International, US Ambassador to Turkey John Bass and US State department spokesman John Kirby, on the domestic level they have made us a target. On January 13, as ordered, The Council of Higher Education in Turkey (YOK) declared that appropriate measures will be taken for those who support terror. The universities that supposedly promote empirical knowledge and freedom of speech published statements defining the human rights abuses as “imaginary” and started disciplinary investigations. Our colleagues are either forced to resign or fired. On January 14, public prosecutors started investigations on the academics that work at the universities under their authorization. Our colleagues had to give their testimony to the General Directorate of Security. The Istanbul Chief Public Prosecutor also launched an investigation into all academic signatories. The accusations range from “making terrorist propaganda” to “ insulting the State of the Republic of Turkey”, a charge that can lead to between one and five years in prison. On January 15, 27 academics were detained in raids conducted on their home and offices. Only after many hours of investigation were they finally released. We also became the target of pro-Government media channels and newspapers. The newspaper Yeni Safak targeted us as “PKK collaborators” by publishing our pictures alongside the pictures of YDG-H barricades. The Yeni Akit newspaper portrayed us as “state enemies” recognising the Armenian Genocide. We were even accused of the Sultanahmet attack. The Akit newspaper labelled us “perverts” for talking about Darwin and “his perverted ideas” in our classes. We are also subject to harassment by the ultra-nationalists. The pictures of academic signatories have been widespread on web pages and in campuses. In Gazi University, the doors of two of our colleagues were marked with crosses and extremist slogans. We also receive abusive e-mails, and death threats on Facebook and twitter all the time. Many Facebook accounts publish our pictures as PKK supporters. No wonder some of our collegues have also experienced nightly death threats. Our web page is also hacked by an ultra-nationalist group. The latest attack of PKK on January 13 worsened the situation. The President continued his demonizing discourse by accusing us of having links to this attacks. We have never supported any kind of violence, but just because we have been portrayed as such by the president and by the pro-government newspapers every single day, the hashtag #1128killers has become a trending topic accusing us of being the supporters of these attacks. As a reaction, we have issued a second statement and declared that we are behind our declaration and our collegues that are charged and who have lost their jobs. We have also underlined that we will start legal processes for those who constantly target us and we will continue to stand against any kind of authoritarianism and human rights abuses. This declaration was also a call on the Government to resume the peace process and to the citizens of Turkey to reject the war. However due to this smear campain we are afraid! Our collegues in Turkey are facing serious challenges from their universities, public prosecutors, ultra-nationalists. We know from experience that these attacks may well lead to assasinations, as in the case of Turkish Armenian journalist Hrant Dink and the prominent human rights activist, Tahir Elci. For the academic signatories who work at international institutions like myself, even if the situation is relatively better, we still have to go back to give our testimony. But we can be faced with detention or travel bans as was the case of Turkish scholar Haydar Darici who works at the University of Michigan. Not surprisingly, some people retrieved their signatures out of fear: but we have also received more signatures. So far, the number of signatories has reached more than 2100, and more keep coming in. We have also received the support of hundreds of journalists, psychologists, psychiatrists, people of letters, actors, feminists, football fans, filmmakers and the support of the Education Union, Progressive Lawyers Association, and Ankara Bar Association. Moreover, 35 thousand students have signed a petition to show their solidarity with us. They also started the hashtag #HocamaDokunma (Don’t touch my professor) that quickly became the trending topic. While asking the government to end the human rights abuses and resume the peace process has put our jobs and even lives in danger, the supporting messages that we have received as a reaction to this organized smear campaign really showed us how many people in Turkey actually want peace.